It’s Valentine’s Day. My husband and I have never made too big a deal of it, too many ghosts of Valentine’s Day past I guess. But, some things happened this weekend that made me see it in a different light. On Saturday night, we looked back at pictures from the year we got married; we have all our pics from the year in one album. There were so many pictures of us just being dorks and doing everyday things. We looked so happy. Not that we aren’t happy now, we just have a lot more on our plate so things don’t seem as carefree as they did then. But, looking at those pictures made me realize that we need to have more fun, that we need to act more like we did then… even if we do have a dog and a baby and more bills. A friend of mine lost her Dad this weekend. A death is always a strong reminder of how short life is. It reminded me that I need to live for today. 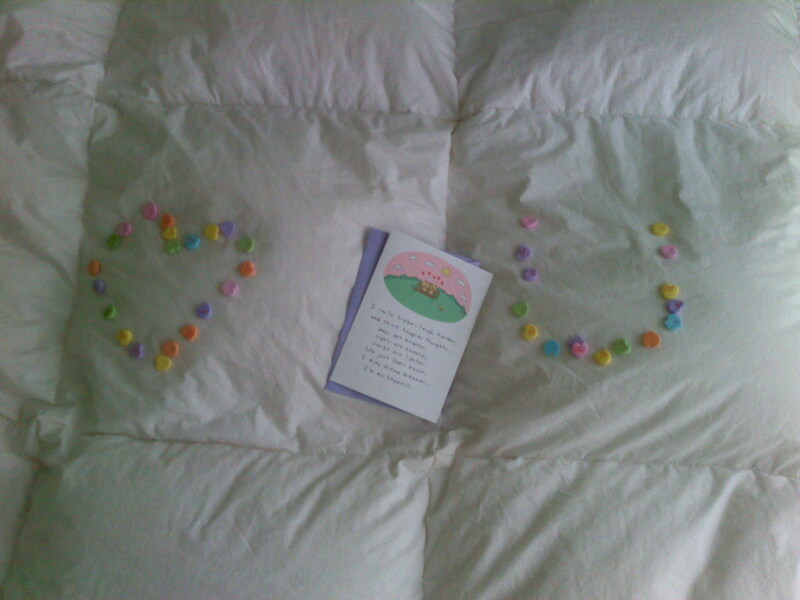 Despite our “let’s not do anything for Valentine’s Day” pact, this morning my hubby spelled out love you in candy hearts on the bed for me. It was so sweet. Tonight at Yoga class, the girl next to me told me she is going to have a baby. That’s always exciting news, but extra special for me, because it was this time 2 years ago when I got pregnant with my daughter. I realized all these things add up to one big thing… LOVE! And that’s what today is about, being loved and loving others… so maybe Valentine’s Day is worth celebrating after all.